kalmd designs a discrete-time Kalman estimator that has response characteristics similar to a continuous-time estimator designed with kalman. This command is useful to derive a discrete estimator for digital implementation after a satisfactory continuous estimator has been designed. The integral is computed using the matrix exponential formulas in . 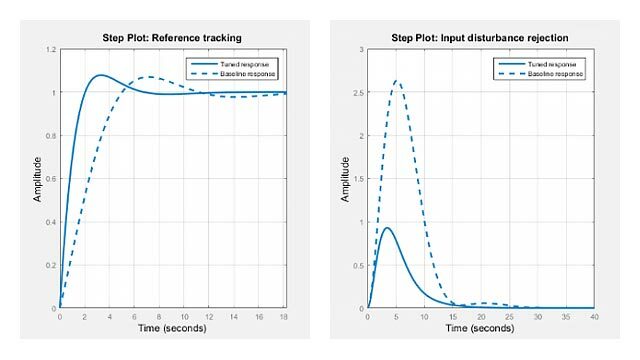 A discrete-time estimator is then designed for the discretized plant and noise. See kalman for details on discrete-time Kalman estimation. kalmd also returns the estimator gains L and M, and the discrete error covariance matrices P and Z (see kalman for details). The discretized problem data should satisfy the requirements for kalman. Franklin, G.F., J.D. Powell, and M.L. Workman, Digital Control of Dynamic Systems, Second Edition, Addison-Wesley, 1990. Van Loan, C.F., "Computing Integrals Involving the Matrix Exponential," IEEE® Trans. Automatic Control, AC-15, October 1970.